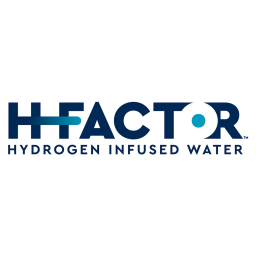 H-Factor is an American functional beverage brand that provides anti-oxidizing, hydrogen infused wate. Pure hydrogen infusion has differentiated this brand from others in the drinking water market. Hydrogen is the smallest and simplest element and people call it ‘the super element’. Hydrogen can deeply penetrate into cells and it has an inflammatory and anti-oxidizing effect, especially eliminating free radicals produced from long-time exercises. Hydrogen infused water can also lower the concentration of lactic acid in blood and rate of muscle fatigue. At the same time, it can improve mitochondrial function and ATP production.